Threads for the South, 770-425-3787. Warning: there are two metric standards, European and Japanese. This will show up in nut size and in thread pitch. For example, in Europe larger bolts tend to be 1.0 or 1.5 threads per mm, in Japan the same bolt is likely 1.25 threads per mm. 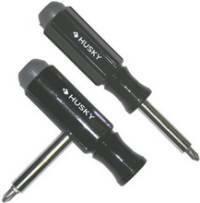 It used to be that you had to buy either Craftsman or Snap-on, or your tools would break. These days the Chinese and Indians have figured out steel, and	essentially all tools are just fine. 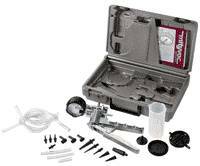 If you have none, go to Sam's Club or Costco and buy a $50-$100 set with sockets, wrenches, ratchets, screwdrivers. This will get you started. You'll need a few extra specialty tools. Nibbler cuts up to 18 gauge (.046") steel, 1.5 mm ( 1/16" ) copper, aluminum, plastic and other unhardened metals. About $9. MoTrax Axle Wrench for Suzukis and Yamahas. About $15. 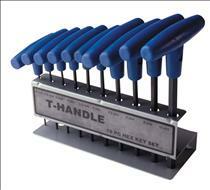 T-handle allen wrench. SAE or metric. About $10. 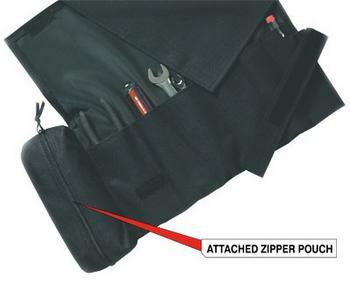 PowerMadd tool pouch. About $22. Most modern chains are endless - they have no master link. To change the chain, your owners manual will tell you to remove the swing arm. This is neither necessary nor fun. 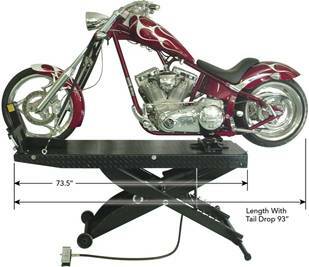 You can get a chain breaking / forming tool from J.C.Whitney or http://www.1888fastlap.com. Call them for a free catalog. I recommend the Emgo / Motion Pro tool shown above. To replace your chain, first break the old chain, anywhere will do. Tie one end of the new chain to the old chain using string or light wire, and pull the new chain through the countershaft sprocket. Pull the new chain about until the two ends are next to each other at about 2 o'clock on the rear sprocket. You'll have to loosen up your rear axle to accomplish this. Put the master link through the two ends, then use your chain tool to rivet the new chain together. 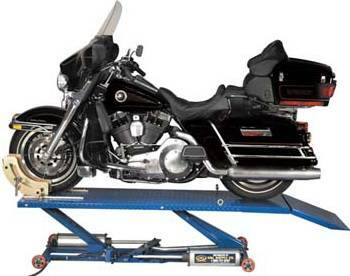 Sam's Club Larin Motorcycle Lift. 1500 pound capacity. $80. K&L Supply MC500 lift. 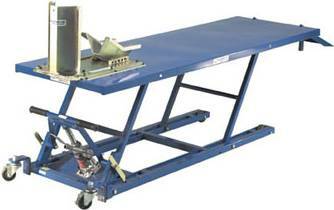 600 lbs capacity, 26" maximum height, work surface 79" x 28". About $600. K&L Supply MC600 lift. 1100 lbs capacity. 27" height, removable panel for access to rear wheel. About $1100. Greg Smith Pro Cycle DT lift. 1000 lbs capacity. 33" height, removable panel for access to rear wheel. Work surface 93" x 24". About $700.